Private Event Hires | Toowoomba Live Steamers Inc. Need a fantastic birthday party that your child and their friends will never forget? Let us provide the entertainment for your group with our miniature trains providing constant rides for both children … and the adults! Take the stress out of entertaining your guests by hiring our miniature railway for your next event. The miniature railway is available for private hire for birthday parties, Christmas parties and family gatherings, etc. When these private charters are running, the railway is closed to the general public. Hire duration is for up to three hours, generally between the times of 10am and 3pm. The Hiring Fee is $250. This provides unlimited passenger rides for the Hirer’s guests for the duration of the Hiring. To confirm your booking, a Booking Deposit of $50 is required within five days of making your booking, otherwise your preferred booking date will be available for other Hirers. The Hiring Fee (less the Booking Deposit) is to be paid 10 business days before the event date, otherwise your Event Hire will not occur and your Booking Deposit will be forfeited. When booking, please provide contact details (email address and mobile phone number) and the approximate numbers of children and adults. This is for our planning purposes so that we have sufficient trains and personnel available to make your day enjoyable. We ask you to confirm your guest numbers 14 days before your Hire date by contacting TLS. What does Toowoomba Live Steamers Inc. supply? Toowoomba Live Steamers Inc. (TLS) will supply locomotives and passenger wagons for the duration of the Hiring. We will endeavour to provide at least one steam locomotive, however depending on availability this may need to be replaced with a non-steam locomotive. Toowoomba Live Steamers cancels the running day prior to opening time of the Event Hire day. Toowoomba Live Steamers cancels the event. It would only be in extreme and unsafe weather conditions that TLS would cancel a Hiring Event. If conditions might be questionable, TLS will advise one hour before the start of the Event Hire whether to proceed with operating. In the unlikely situation when a Private Event Hire has already commenced and is then unexpectedly cancelled by TLS, refunds may be made depending on circumstances. The Hirer cancels more than 14 days before the Event Hire day and the Hiring Fee has already been paid. As we operate a club account requiring two signatures, refunds will be paid by cheque. All passengers on the trains MUST have enclosed footwear. 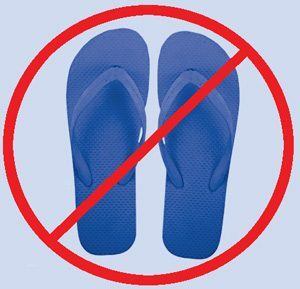 You cannot ride on the trains wearing sandals, thongs or similar open footwear – bare feet, open sandals or thongs will NOT be tolerated. This is an insurance and health and safety requirement. Hosts of Private Hire Events are responsible to inform their invited guests (including adults) that they MUST wear enclosed footwear to ride on the trains. If an incident does occur and someone is injured, PLEASE report this to the TLS member at the Ticket Sales Table at the Station. If you or anyone else requires some assistance, there is a stocked First Aid Kit at the Ticket Sales Table available for use if required. Children and adults can ride on the trains. All children 5 years and under must be accompanied by an adult/responsible teenager on the ride. Each ride takes approximately 8 to 10 minutes on our 900 metre of track. Miniature locomotives, particularly steam locomotives, are hot, dirty and smelly. They have hot fires inside them which drop hot ashes and emit smoke and soot. Because of the prevalence of ashes, coal dust, oil and smoke, it is strongly recommended that ‘your finest clothes’ are not worn when visiting. Public Toilets (including disabled friendly) are available nearby, approximately 200m from our station area. There is a covered gas barbeque adjacent to our station available to park users and playground equipment. Please note that Lemway Park is a public park, and the BBQ and playground are available to other park users and are not reserved as part of Private Event Hires. Lemway Park is mostly accessible to wheelchairs, although there are some concrete paths in the vicinity, most of the area has a grassed surface. Nearby public toilets are available approximately 200m from our station area, and an adjacent concrete path (West Creek Pathway) is available between our station area and these toilets. Please note that our train carriages require passengers to sit astride a bench seat (one leg on each side). If a passenger has limited mobility, the person (or their carer) is responsible to ascertain the suitability of riding (boarding, riding and then disembarking) the passenger wagons. As Lemway Park is a public place, under the Liquor Act 1992 the consumption of alcohol is prohibited. We reserve the right to ask you to leave if you consume alcohol. You are responsible to bring your own food and drinks, party decorations, tablecloths, cutlery, crockery, barbeque tools, chairs, tables and appropriate weather protection (incl sunscreen protection). Please avoid bringing glass items to the park. Lemway Park is a public park, you and your guests are to be mindful of other park users. All people attending Toowoomba Live Steamers Inc. Miniature Railway must have a great time! If you any further questions, please don’t hesitate to get in touch, refer the Private Event Hire contact on the TLS Contacts webpage. The Private Event host (the Hirer) is required to arrive in sufficient time to prepare your event prior to your guests arriving.